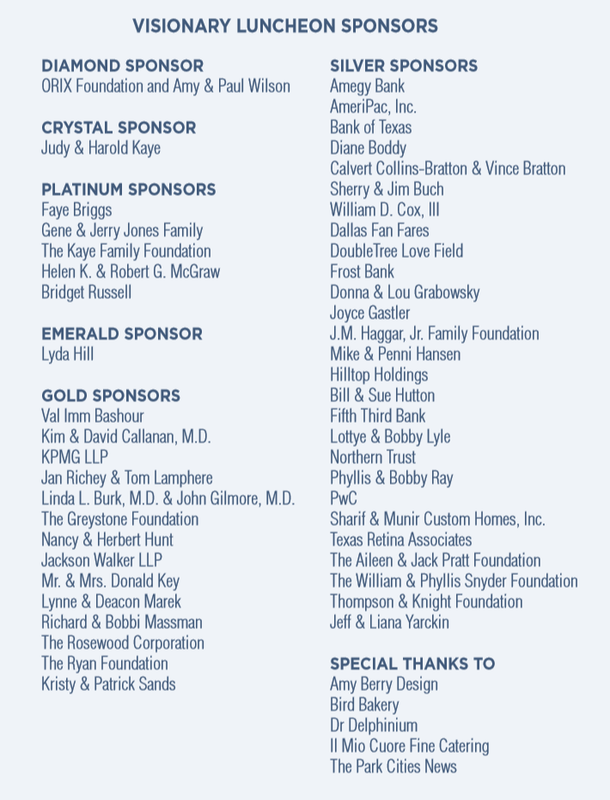 On behalf of our Luncheon Co-Chairs, Therese & Chris Rourk and Lisa & Brian Tibbs, our Host Committee, and the entire team at the Retina Foundation of the Southwest, thank you for making the inaugural Visionary Luncheon such a success! If you didn’t get a chance to donate, it’s not too late… text RETINA to 414-44 now. Be sure to tag us in your own photos on Facebook, Twitter, and Instagram using the hashtag #VisionaryLuncheon! 2018 marks the 35th anniversary of vision research at the Retina Foundation of the Southwest. 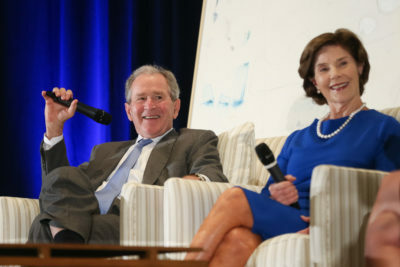 To celebrate this milestone,we were fortunate to have had President and Mrs. George W. Bush speak together at our inaugural Visionary Luncheon on Friday, March 2, 2018 at the Omni Hotel in Dallas, Texas. The event was moderated by multi-Emmy-award-winning journalist, Shelly Slater. Our emcee was the Chairman/CEO of the Emmy Award-winning video/television production and A/V event company, Murray Media, Scott Murray. The Retina Foundation of the Southwest depends on community support and donations to fulfill its mission to prevent vision loss and restore sight through innovative research and treatment. Each year ~2,300 infants, children, and adults receive in-depth vision evaluations at no charge to advance our research and clinical trials that result in better treatments for eye disease.